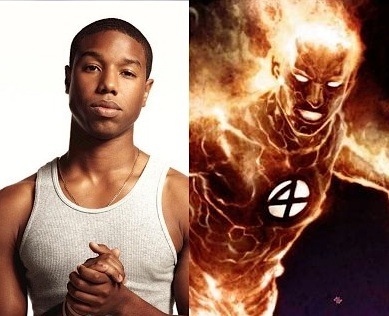 According to sources, Friday Night Lights star Michael B. Jordan is in talks to play the Human Torch in a Fantastic Four remake. The movie, not due in theaters until 2015, already has a director in Josh Trank, who worked with Jordan on Chronicle. Johnny Storm (Torch) is white in the ongoing Marvel series and was played by Chris Evans in the 2005 and 2007 films. Allison Williams of Girls is said to be in contention to play his sister, Susan. I’m just going to go ahead and say that I usually don’t like when movies pull a race switcheroo. If the character is white in the source material, why make him black? Just because you can? The problem with casting according to the race of the original comic book character is that there were very few well known comic heroes of color that would be considered for a film. They have to re-cast the role regardless, so why not give it to someone as hot as Michael B. Jordan? You won’t even be able to see the color of his skin when he’s engulfed in flames.